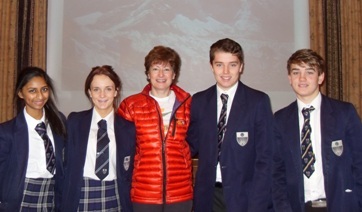 GSAL students have been inspired by a Harrogate woman’s trek to Everest base camp to help women in war-torn countries and raise awareness of the role of women in bringing about peace. Jackie Terry-Schuhmann visited the school to talk to Y10 and 11 students about the vital work being done by Women for Women International UK, a charity which helps women victims of war to rebuild their lives. She was part of a team of 10 women who vowed to raise £100,000 from the 12-day inspirational hike. Jackie has so far raised £7,700 of the £10,000 which she has pledged and received a further £777 boost from GSAL students. Following her talk, the 14 and 15-year-olds collected just over £388 which was doubled by the Big Give, a charitable organisation offering to match donations for a limited period. Jackie told the students how the team had taken a chain of prayer flags on the trek, bearing messages from women all over the world. They attached them to flags already left at Everest base camp for future visitors to see. She said: “As well as raising much-needed funds, we also wanted to raise awareness of the need for real investment in women in order to bring about sustainable peace and development in countries affected by conflict. Jackie Terry-Schuhmann is pictured with students. They are (L-R) Demi Patel, Clarissa Pearce, Charles Etchells and Jeremy Huitson.